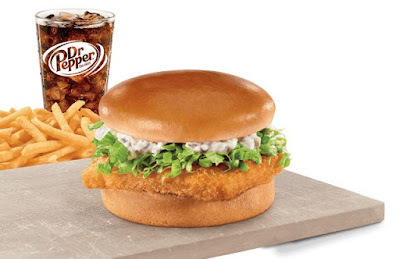 The Fish Sandwich makes its annual return to Jack in the Box restaurants for the 2017 Lenten season. The sandwich consists of a wild-caught Alaskan pollock fish filet breaded in panko breadcrumbs and deep-fried, tartar sauce, and shredded lettuce on a plain bun. It's featured in a combo along with small fries and a small drink. Prices for the combo vary with location (it goes for $3.99 in my area). The Fish Sandwich is available for a limited time, while supplies last. Look for it to stick around until at least mid-April.